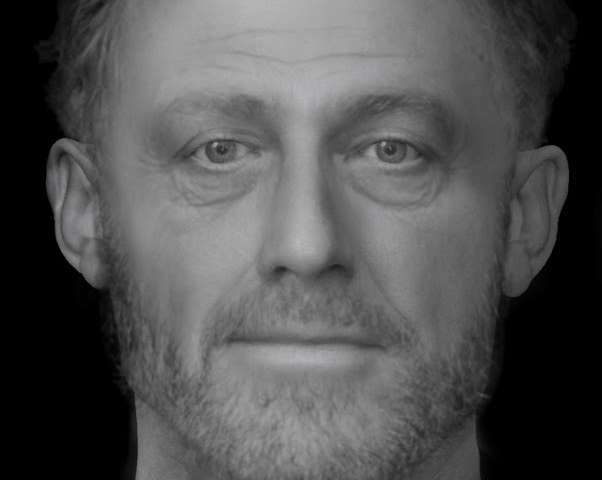 New facial reconstruction of a man buried in a medieval hospital graveyard discovered underneath a Cambridge college sheds light on how ordinary poor people lived in medieval England. The audience of an event at this year's Cambridge Science Festival found themselves staring into the face of a fellow Cambridge resident – one who spent the last 700 years buried beneath the venue in which they sat. The 13th-century man, called Context 958 by researchers, was among some 400 burials for which complete skeletal remains were uncovered when one of the largest medieval hospital graveyards in Britain was discovered underneath the Old Divinity School of St John's College, and excavated between 2010 and 2012. The bodies, which mostly date from a period spanning the 13th to 15th centuries, are burials from the Hospital of St John the Evangelist which stood opposite the graveyard until 1511, and from which the College takes its name. The hospital was an Augustinian charitable establishment in Cambridge dedicated to providing care to members of the public. "Context 958 was probably an inmate of the Hospital of St John, a charitable institution which provided food and a place to live for a dozen or so indigent townspeople – some of whom were probably ill, some of whom were aged or poor and couldn't live alone," said Professor John Robb, from the University's Division of Archaeology. 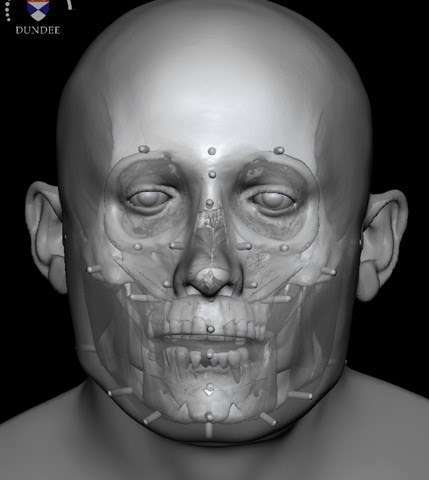 In collaboration with Dr Chris Rynn from the University of Dundee's Centre for Anatomy and Human Identification, Robb and Cambridge colleagues have reconstructed the man's face and pieced together the rudiments of his life story by analysing his bones and teeth. 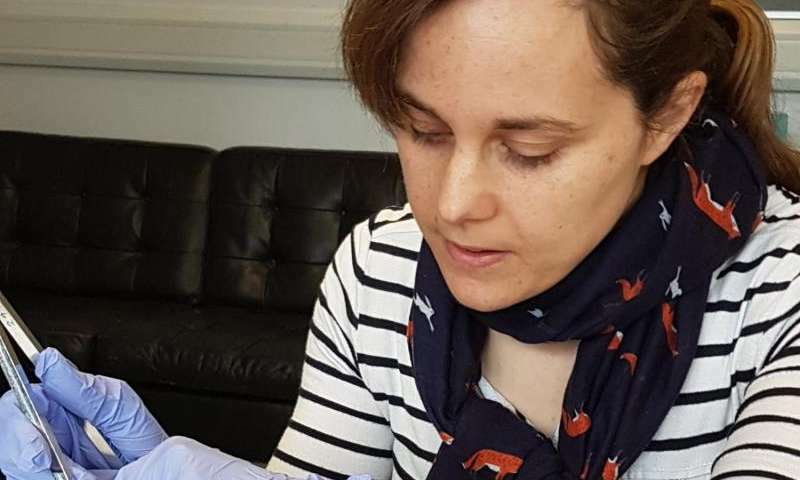 The work is one of the first outputs from the Wellcome Trust-funded project 'After the plague: health and history in medieval Cambridge' for which Robb is principle investigator. The project is analysing the St John's burials not just statistically, but also biographically. "Context 958 was over 40 when he died, and had quite a robust skeleton with a lot of wear and tear from a hard working life. We can't say what job specifically he did, but he was a working class person, perhaps with a specialised trade of some kind," said Robb. "One interesting feature is that he had a diet relatively rich in meat or fish, which may suggest that he was in a trade or job which gave him more access to these foods than a poor person might have normally had. He had fallen on hard times, perhaps through illness, limiting his ability to continue working or through not having a family network to take care of him in his poverty." There are hints beyond his interment in the hospital's graveyard that Context 958's life was one of adversity. His tooth enamel had stopped growing on two occasions during his youth, suggesting he had suffered bouts of sickness or famine early on. Archaeologists also found evidence of a blunt-force trauma on the back of his skull that had healed over prior to his death. "He has a few unusual features, notably being buried face down which is a small irregularity for medieval burial. But, we are interested in him and in people like him more for ways in which they are not unusual, as they represent a sector of the medieval population which is quite hard to learn about: ordinary poor people," said Robb. "Most historical records are about well-off people and especially their financial and legal transactions – the less money and property you had, the less likely anybody was to ever write down anything about you. So skeletons like this are really our chance to learn about how the ordinary poor lived." The focal point of the 'After the Plague' project will be the large sample of urban poor people from the graveyard of the Hospital of St John, which researchers will compare with other medieval collections to build up a picture of the lives, health and day-to-day activities of people living in Cambridge, and urban England as a whole, at this time. "The After the Plague project is also about humanising people in the past, getting beyond the scientific facts to see them as individuals with life stories and experiences," said Robb. "This helps us communicate our work to the public, but it also helps us imagine them ourselves as leading complex lives like we do today. That's why putting all the data together into biographies and giving them faces is so important." The Old Divinity School of St John's College was built in 1877-1879 and was recently refurbished, now housing a 180-seat lecture theatre used for College activities and public events, including last week's Science Festival lecture given by Robb on the life of Context 958 and the research project. The School was formerly the burial ground of the Hospital, instituted around 1195 by the townspeople of Cambridge to care for the poor and sick in the community. Originally a small building on a patch of waste ground, the Hospital grew with Church support to be a noted place of hospitality and care for both University scholars and local people.